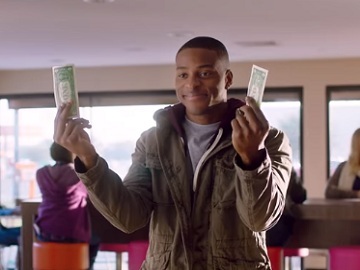 Dunkin’ Donuts promotes its 2 For $2 Wake Up Wrap limited-time offer in a new commercial. The 15-second spot, highlighting that, with Dunkin’ deal, you get two Egg & Cheese Wake Up Wrap Sandwiches for $2, features a young man who, after buying two of those wrap sandwiches for only $2, is given a high-five by passers by and even by a dog. The voiceover urges viewers to stop in for the latest Dunkin’ deal, adding, at the end, the company’s tagline, “America Runs on Dunkin'”. The global donut company and coffeehouse also promotes its Dunkin’ On-The-Go mobile ordering app, which enables users to order ahead and skip the wait, in a series of new ads aimed at showing people that this app helps them get where they want ‘”right on time”.